that her control is only an illusion. that her Maker knows of all her needs. that she has been created with purpose. that her Creator is keeping her from slipping. This entry was posted in Christian Poetry, Devotional, poetry, Ponderings, Revival and tagged forgiveness, fragile lives, grace, hope, Jesus Christ, Jonathan Edwards, judgement, repentance, revival. Bookmark the permalink. Thank you, Heidi. Your reflection reminded me of that film of a few years ago, “The Matrix”, with its clever way of looking at what we consider to be reality, only from the perspective of an even bigger reality: a sort of looking at life from the outside. Your analogy of the spider, locked in her own tiny world is a great parable for most of our lives: focussed on our own concerns, unable to see that our Lord has a much larger perspective for us. (I’m very guilty of that!). On a completely different subject: I love the photographs. hab mir die tolle Aufnahme angesehen, deine Zeilen gelesen und finde beides sehr schön. Wenn man nur die Augen öffnet, kann man immer wieder Gottes Schöpfung bewundern. Vermiss’ Euch auch ganz doll!!! Hello again dear Heidi. Beautiful poem and the centre of the web reminds me that we should always keep our eye on the cross for we are the apple of His eye. Wow! What a blessing and a magnificent image and poem! The quote is so fitting, too. Very powerful post. 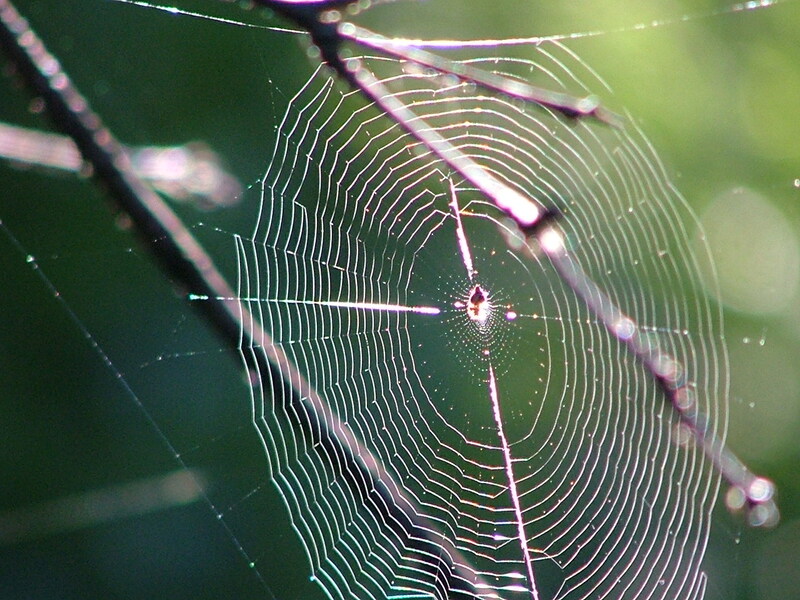 That spider web is a beautiful reminder of Jesus–in such an unsuspected place. And that imagery created by Jonathan Edwards is powerful–being pulled down to hell by our sins! Yikes! Your post reminded me of the magnitude of what Jesus did for me at Calvary. Thank you, Heidi, and thank you, Jesus! It amazes me how and where God chooses to reveal His character to us. Let’s keep our eyes wide open 🙂 Thanks, Nancy, for your kind words of encouragement … Blessings to you! Touching post– beautiful, power-drenched reminder of God’s sovereignty! He’s been reaching out to me and reiterating that He is more than enough and has all things under His control! Your lovely photo and words were soothing ointment this morning! Thank you!! Thank you, Ali, for stopping by and commenting. Yes, God is sovereign. I too, need reminders of this fact often. He is truly enough … I have heard it said, “Jesus + Nothing = Everything 🙂 Bless you, sister! Ooooh! I love that math!! 😉 God bless you, as well!! Powerful words from Edwards. We don’t preach like that today. I think we’re the losers for it. I went out to work one morning and a spider was busily weaving a web from the ground to one of my truck’s tires. I watched in amazement as this creature wove a marvel of symmetry and beauty. It was a shame I had to destroy it to go to work. Heidi, this is a beautiful post in every way, and Romans 1:20 is the perfect encore. Thank you Wendy for reading and commenting. Hope you are well … so appreciate your blogs 🙂 Blessing and love to you! Heidi — that was absolutely powerful, giving everyone something to pray and ponder on. God bless you, my friend. May He continue to bless you as share from His Word with us 🙂 Love to you! I remember reading that sermon for English class before I became a Christian. This wasn’t a Christian school, but I believe this sermon was one of the things God used to draw me to Himself. Thanks for sharing! That’s an incredible testimony … thanks for the comment … Bless you today, dear sister! We have such a beautifully intimate God … He knows how to speak to our hearts and captivate them … Hugs to you, friend! The cross the web and the words are captivating! God’s gifts to us are amazing, aren’t they … Thanks, Caddo! Thanks so much, dear Sue~ heading over to your place as we speak 🙂 You bless me with your posts and comments!